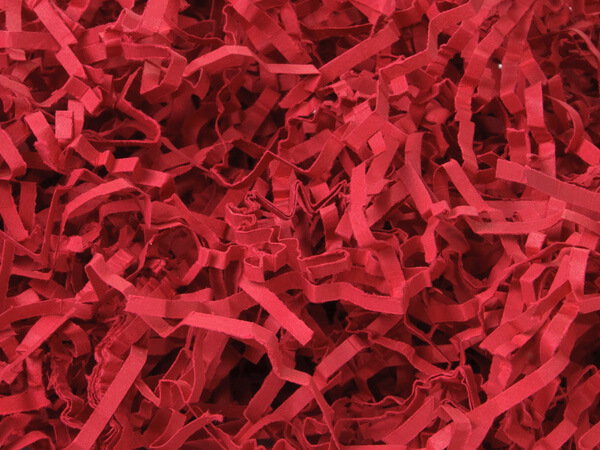 Red Eco Fill Accordian Paper Shreds is made from 100% recycled paper. Shred is approximately 1/8" and sold in 24 lb. cartons. Green Way® Eco-Friendly Packaging. Made in the USA. NOTE: Product ships as Dimensional Weight of 67 LBS due to volume of carton (18"x24"x30"). Our crinkle cut shreds are made from a heavier basis weight of paper than most competing shreds and expands to twice its volume. It is perfect for using in gift baskets, Easter baskets, and basket box ! Pound for pound this shred will fill at least 50% more containers. This shred provides excellent support for your medium to heavy weight products and the 24 lb box, by volume, is equal to its competitor's 40 lb box of shred.